Don’t lose revenue by having to close down your outdoor seating area because of the upcoming rainy and windy seasons. At Southern Patio Enclosures, our commercial window panels are made with tough PVC vinyl, offering protection against all elements and built to handle daily use for many years. The tracks of our systems are made from extruded-aluminum, expertly manufactured so that the curtains don’t get caught when deployed, making them last longer than any competitor. If your business is along the coast, then you are well-familiar with the strong winds that blow away napkins and tablecloths, discouraging customers from sitting outside. 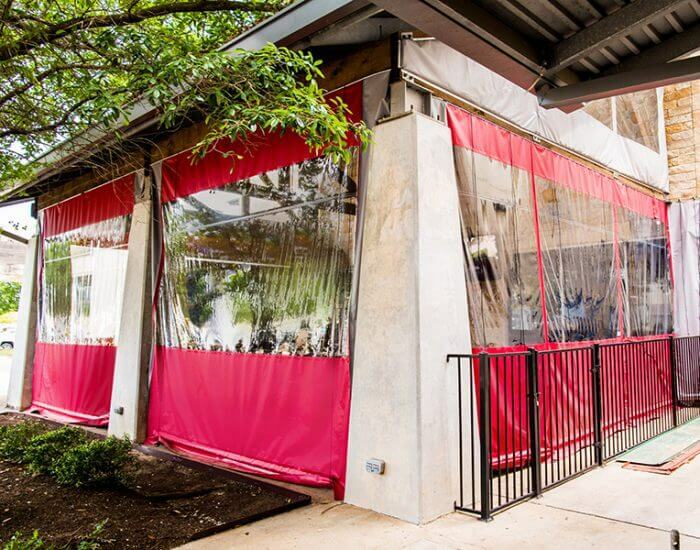 Our windscreens can easily help stop the chaos of having high winds disrupt your dining patrons’ experience. Our manual windscreens offer wind protection against 45 mph and our motorized screens are strong enough to endure up to 65 mph winds. For extreme protection, our screens can also be manufactured to be hurricane resistant, withstanding winds of up to 120 mph. Worried that installing a windscreen will block the scenic view surrounding your business? Our panels are made with clear vinyl material, allowing customers to enjoy an unobstructed view of your landscape with full protection from the elements. Every product we make is built to your space’s specifications and customized to meet its design. Get Started on Your Weatherproof Investment Today! The start of a new year is the perfect opportunity to make the changes to your restaurant that will boost your revenue. Contact us today to learn more about our products and to receive a complimentary quote!